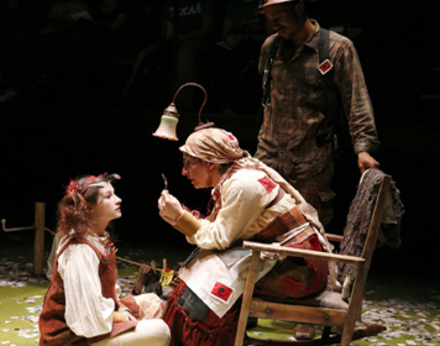 From February 28 to March 8 the Clarice Smith Performing Arts Center will show The Ash Girl, written by Timberlake Wertenbaker and directed by Leslie Felbain. 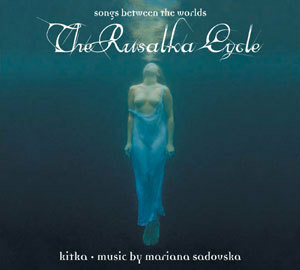 Says the notice: "Celebrated playwright Timberlake Wertenbaker spins the Cinderella fairy tale back to its Central European roots as she conveys the Ash Girl's tumultuous journey toward self-discovery with poetic language and compelling metaphors." Timberlake Wertenbaker has written a host of plays, some of which are collected in Timberlake Wertenbaker: Plays One and Timberlake Wertenbaker: Plays Two. Go here to read more about her. You can also learn more about the story of the Ash Girl in Terri Windling's article, "Ashes, Blood, and the Slipper of Glass," or in Helen Pilinovsky's article, "Donkeyskin, Deerskin, Allerleirauh: The Reality of the Fairy Tale." 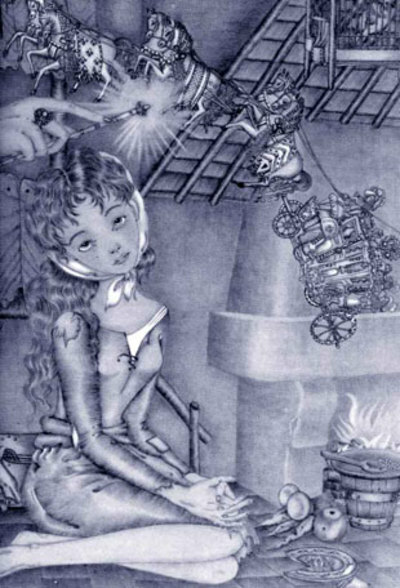 The image above is by Adrienne Ségur. 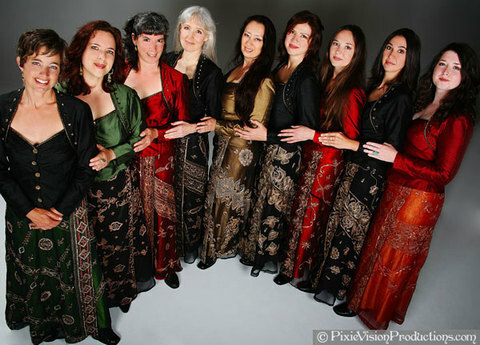 The video above captures several members of Daughters of Elvin in performance at the Oxford Folk Festival. (Daughters is a medieval music and dance troupe based here in Devon, directed by my good friend Katy Marchant -- playing pipe and tabor in this video.) The masked figure who emerges halfway through the song (based on medieval Woodwose legends) is just one of the many mythical creatures who turn the Daughters' sublime music into spells of incantation. 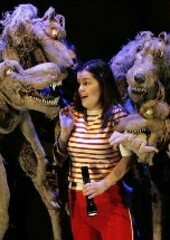 The Woodwose mask was made by Katy, but the group also use masks and costumes designed by Alan Lee and Wendy Froud. You can read more about the group here (in an article from JoMA's archives), or visit the Daughters of Elvin MySpace page to hear more of their glorious music. 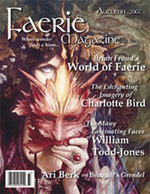 And I hope you didn't miss Chanda Cerchione-Peltier's in-depth article on Katy and the Daughters in the Summer 2007 issue of Faerie Magazine. Speaking of Faerie Magazine, Chandra has asked us to mention the current Fall issue, which does indeed sound promising. "In the new issue," she says, "I interview [film puppeteer] William Todd-Jones, Ari Berk writes about Beowulf's Grendel, SurlaLune's Heidi Ann Heiner offers a history of Rapunzel, and there is a wonderful spread about Brian Froud's new book, World of Faerie. The magazine is available in the US through booksellers such as Barnes & Nobles and Borders; for readers in the UK, issues can be purchased through I Do Believe." The photograph above, "Desert Diwali" by Stu Jenks, comes from a flamboyant (if somewhat untraditional) celebration of the Hindu Festival of Light hosted by the pyrotechnic group Flam Chen in Tucson, Arizona. See Stu's blog for his description of the event. "A giant power plant has taken over a mythical town. Dark clouds of ashes obscure the sky, and no one has seen sunlight in generations. People in the town are beginning to 'disintegrate' from a mysterious illness. When Nini, a young girl, loses her mother to the illness, she goes on a journey into a mysterious underworld of coal mining shafts and caves where the walls are alive. Through a series of challenges and encounters with interesting new characters, Nini searches for a secret that could possibly save the world above....Ashes, Ashes is a show for family audiences, though the themes are complex and the language poetic." Coinciding with the production, fairy tale scholar Jack Zipes gave a talk last week titled "And Nobody Lived Happily Ever After: The Feminist Fairy Tale and Its Consequences" -- oh how I wish I could have been there! I apologize to our Texas readers for not informing you in time, as we only just learned of the event. (The talk was covered by The Daily Texan, here.) For more on Ashes, Ashes, go to the university's Department of Theatre and Dance website. Douglas Gresham has published a moving tribute to his stepfather, C.S. Lewis, in a recent edition of The Guardian -- timed to co-incide with a new London staging of William Nicholson's Shadowlands, the moving play about C.S. 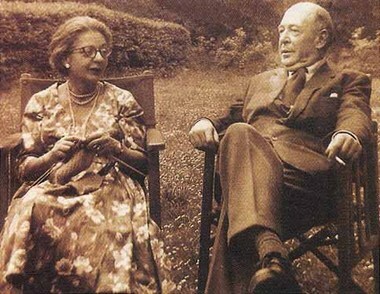 Lewis (known to his stepson as "Jack") and Gresham's mother, Joy Davidman. For more information on Shadowlands, visit the Wyndhams Theatre website. Last autumn, we recommended the Improbable Theatre Company's show The Wolves in the Walls, a "musical pandemonium" based on a fabulous children's book by Neil Gaiman, illustrated by Dave McKean. This autumn, we're pleased to report, the show will be traveling from the UK to New York's New Victory Theater. I expect tickets are going to go fast, so even though it's not until October (October 5 - 21, to be precise), it's probably best to reserve tickets soon. 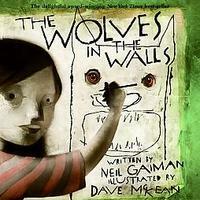 Click here for more information, and here for a nifty little Wolves in the Walls animation. “Our best work comes from mistakes and accidents; theatre is too important to take too seriously.” -- The Improbable Theatre Company. In this video from the Human Forum Conference in Puerto Rico, Endicott contributor Ari Berk discusses the need for wonder in children's lives. He's introduced (in song!) by Fred Johnson. Part II of Ari's talk is here. Continuing our year-long celebration of the Endicott Studio's 20th Anniversary, we're continuing to add new pictures to our 20 Years of Mythic Arts page -- such as the photograph of Lillian Todd-Jones above, added just this morning. Lillian, who recently turned 18, wasn't yet born when the Endicott Studio began. 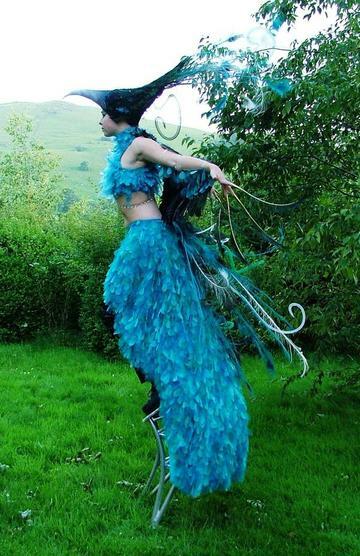 In this magical picture she's getting ready to perform as a dancer (on stilts! ), poi twirler and fire-juggler extraordinaire at a very groovy summer festival here in England. She's playing the role of Kineree, a legendary Bird Goddess of Thailand, in a costume designed by her father, the film and stage puppeteer William "Todd" Todd-Jones. 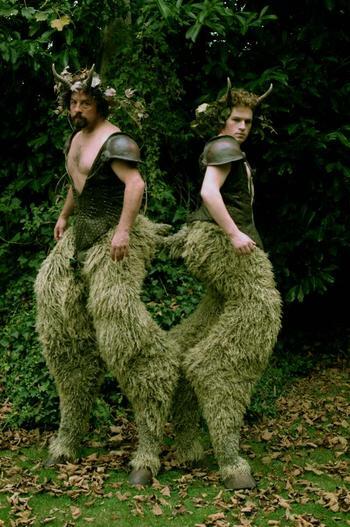 (The costume was fabricated by Gabrielle Peckham, and the stilts were built by Dean Gardiner.) Lillian has performed onstage with the Scissor Sisters at the BAFTAs, in The Rhino Drum Show, and at the Faerieworlds Festival in the United States. She has also had small parts in films and on television, and can be fleetingly glimpsed in the latest Harry Potter movie. She's currently a student, pursuing studies in animal conservation and art.